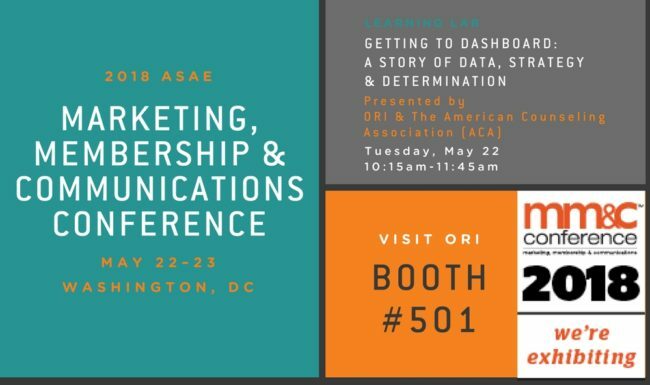 ORI will be exhibiting and presenting at the 2018 American Society of Association Executives (ASAE) Marketing, Membership & Communications Conference (MMCC), being held May 22-23 in Washington, D.C. The annual gathering of association and nonprofit professionals will explore the latest in engagement, technology, and trends from industry innovators to take marcomm and membership strategies to new heights. Lesley Boucher, ORI’s Vice President of Consulting & Customer Experience, will join leaders from The American Counseling Association (ACA) to present “Getting to Dashboard: A Story of Data, Strategy & Determination.” The Learning Lab will be delivered Tuesday, May 22, from 10:15am to 11:45am. Mark your calendar for the Learning Lab and drop by ORI Booth #501 to chat with our team about data challenges and opportunities to strengthen customer experience and member engagement. Data Aware: You know data provides critical insights into your members’ behavior and drives product and services decisions, but you don’t have easy access to even simple metrics and analytics. You have a clear vision and a strategic plan, but key metrics aren’t identified. Data Ready: It exists—and you have access—but data is spread throughout multiple databases and spreadsheets and you don’t know where to start harnessing and analyzing. Data in Progress: Data is harnessed but execution and analysis is waning and the political waters are churning. At the end of the session, you’ll know what key questions every organization needs to ask itself regarding external customer needs and how to translate those key questions into KPIs.